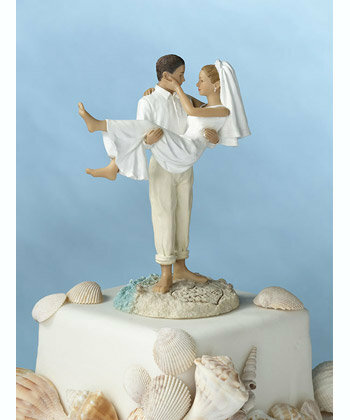 The just married figurine is a wonderful accent to your beach themed event. The happy newlyweds are depicted walking on the beach with the bride lovingly cradled in the groom's arms. The base of the painted poly resin figurine shows the ocean waves on one side and the sandy beach on the other. Skillfully crafted, these beach wedding accessories have intricately carved details that bring the loving couple to life, including the 'Just Married' written in the center of a heart on the base. Measuring 7" tall, the just married figurine will soon become a treasured memento of your special day.